Perfect conditions at Queensland Raceway complemented a perfect run of results for Team Honda’s Jamie Stauffer who dominated both races of round 5 of the QBE Australian Superbike Championship today. Yesterday’s polesitter was eager to convert his grid position to maximum points, an outcome that would re-energise his team which has faced an uncharacteristic struggle in the first half of the season. Stauffer lowered his own lap record this morning to 1:09.125s to take a 2.423s victory over Team Suzuki’s Josh Waters and Procon Maxima BMW’s Glenn Allerton. Another good start this afternoon saw Stauffer win by a similar margin – 1.993 seconds separated him from Allerton who held off a charge from Stauffer’s teammate Wayne Maxwell. 51 points sees Stauffer the clear QBE Superbike round winner today, with Allerton second and Waters third. 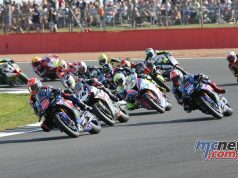 A two-time Australian Superbike Champion, Stauffer is elevated to second in the championship, 56 points shy of Allerton who remains in charge with a comfortable buffer. The i-Style Natural Aprilia Team’s Ben Attard retains third in the points chase with a solid run this weekend. The battle for Superbike honours resumes in August as Queensland Raceway hosts the second ‘2+4’ meet for the year featuring the ASBK alongside V8 Supercars. Today’s pair of QBE Supersport races produced a carbon copy of results, with the Yamaha Racing Team’s Kevin Curtain taking two narrow race wins and the overall. Teammate Rick Olson finished third, bookending Brendan Clarke who returned to the track with a spirited ride on the Champion’s Ride Days Honda. The trio traded positions with a number of slipstreams and late-braking moves, and it was Curtain who was in the lead as the chequered flag waved on both of the 17-lap races. Championship leader and polesitter Mitchell Carr had a day to forget, with clutch problems ending his race early this morning and a crash at turn 3 resulting in a finish at the back of the pack. Curtain leaves Queensland Raceway as the new points leader, with Carr dropping down the order to sixth. Team Suzuki’s Brodie Waters’ consistent run elevates him to second in the championship, 21 points off the lead. Christian Casella, Aaron Gobert and Rick Olson round out the top five after the penultimate round of racing, with the class next on track at Phillip Island in November. Team Honda Racing dominated at Queensland Raceway this weekend for Round 5 of the Australian Superbike Championship with #27 Jamie Stauffer taking the Superpole point yesterday, P1 for both qualifying sessions, 2 race wins today and even breaking his own lap record in the Superbike class. Stauffer now sits 2nd in the championship in what can only be described as a magic weekend for Team. Both Team Honda Racing riders saw a terrific improvement in the set-up of the CBR1000RR with some changes made to the front forks after practice on Friday and found their championships turning around. #47 Wayne Maxwell finished his weekend 4th overall and is really pleased with the direction he is now going with the set-up of the Honda. The fastest lap of the day which broke the Superbike lap record was Jamie’s with a 1:09.125 sec on lap 2 of Race 1. Starting from P1, Jamie lead from start to finish for both races and it seemed nobody had an answer as his Motologic-prepared CBR1000RR pulled away. Elated by his win, the Newcastle rider even took a moment to give the Team Honda Racing Corporate guests on the hill a quick thrill with a ride by. Doric Products, Architectural Window Systems, Bank of Queensland and Honda corporate guests were thrilled by the day’s success. Team Principal Paul Free is excited by the team’s turn around and is eager to build on the Round 5 success and reduce the points gap even further at Round 6 in August. Yamaha Racings’ tarmac trio of Kevin Curtain, Pat Medcalf and Rick Olson featured prominently at round five of the Australian Superbike Championship (ASBK) at Queensland Raceway. Curtain nailed the round victory in the 600cc Supersport class with Olson in third, while Pat Medcalf claimed victory in the 1000cc Pro Stock class. On a mild winters’ day and dry track conditions, Queensland Raceway again provided great racing with Yamaha’s factory supported team winning in its home state round. Curtain claimed the round victory by winning both 17 lap legs but it wasn’t without its share of drama and hard work. Curtain took control early in race one and sped off to a two second victory. But race two proved to be a battle to the end as Curtain, team mate Olson and Brendan Clarke sprinted from the pack and engaged in a race long fight. Curtain held sway until the later stages of the race where both Clarke and Olson were able to sneak by. But remarkably, Curtain was able to get around both riders by the second last lap and then set his fastest lap of the race on the 17th and final lap for a final winning margin over Clarke of .145 of a second and another 1.5 seconds back to Olson. Curtain’s experience on the track and never ending fighting spirit again rose to the surface and he was rewarded with the round win. The 1-1 performance now sees Curtain in the lead of the 600cc Supersport class on 155 points, 21 clear of his nearest rival with one round remaining at Phillip Island. “The track here at QR is always tough as there isn’t much to separate the riders. As a rider, you know when you get here you have to be on your game for every lap, of every race, and there is no such thing as an easy win here,” Curtain explains. “But it’s nice to come away with the win as the team is based here in Queensland and we are now back on top in the points, exactly where we need to be,” he finished. Rick Olson has proven to be a worthy understudy for Curtain and on more than one occasion as shown his older and more experienced teammate how it’s done. Olson was again right at the front of the pack over the weekend, carding 3-3 race results to take third overall for the round. As mentioned, Olson was right in the heat of the battle in race two and even hit the lead with just over a lap remaining but a missed line in turn six which dropped him back a couple of seconds. The third place now sees Olson sit in fifth place and still within striking distance of a podium if he has a big final round. Pat Medcalf also got into the winning spirit taking a well earned victory in the 1000cc Pro Stock class. In his first outing at the ASBK rounds, Medcalf hit the bitumen all guns blazing taking 2-2-1 race results to claim the round win in an impressive ASBK debut. 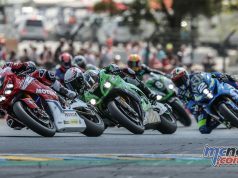 “To win two classes and have every rider on the podium at the end of a round always means the team has had a great day,” says team manager, John Redding. “The form of Kevin, Rick and Pat is also good so we look forward to the Phillip Island round and a big finish to the championships,” Redding comments. 1640 – Just uploading the interviews from the Supermoto podium winners then that is done for the day, hope you enjoyed the coverage and I know a lot of people have been following this on their phone this weekend so I hope you guys enjoyed the phone friendly format. Feel free to give us some feedback on the service via our facebook page or similar. 1632 – Reekie leads this final bout by 16 seconds now. Nicolson a clear second. 1626 – In the navigation above you can now download full results from all classes and podium interviews for all classes apart from the Supermoto S1/S2 category which is having its final race right now. Reekie running away with as per normal, Nicolson giving brave chase, Laing and Taylor tussling over third place. 1559 – Herfoss is second last now, he must have run off somewhere and rejoined. Stauffer leads by 2.7 seconds ahead of Allerton now, Attard only a couple of tenths of Allerton and readying to make a challenge. Maxwell there also and in the hunt for a podium. Waters is back up to fifth but out of the hunt for a podium due to some sort of drama early in the race, the gap too large for him to join that pack with eight laps to run..
1557 – Allerton the only one of the top five not to do a 9 that lap, coming under attack from Attard now… Maxwell quick and closing on that duo length by length.. Jamie leads by nearly two seconds now..
1555 – 17 lap encounter this so still a long way to go. The top four all in the 9s now, Jamie the pacesetter with a 9.239. 1553 – Waters has made a mistake or had a problem as a swag of riders just swept past him. Another rider down at turn three, not sure who as yet… Jamie still leading from Allerton then it is Attard. Waters down to seventh, and now we can see it is Bugden that went down right in front of his fan club down there at turn three. 1552 – Jamie leads them down the main straight for the first time, a few tenths ahead of Allerton then it’s Waters, Attard, Coxhell, Herfoss, Maxwell, Bugden. 1535 – Falzon up alongside Jones into turn three and looked to have him but Jones kept it, he tries again at the double-left, but can’t do it, he can’t challenge at the final turn though so Jones takes the victory by 0.469 of a second, and Falzon second, a fighting second, an encouraging second place that has showed for the first time this season that he can challenge Jones. Thackeray putting in a great performance also, comes home third, 3.6 seconds behind the winner. 1508 – Medcalf leads by three seconds now with three laps to run, Halliday has got past Ross for third place but 2.5 seconds behind second placed Magee..
1500 – ProStock Race Three underway! Walters from the outside of the front row gets a great run off the line, Medcalf into second, Halliday third as they enter the first turns. 1435 – The tarmac only Supermoto side of things next with the Supermoto RR category having their final bout. Expect another Geronomi whitewash…? 1409 – Clarke and Olson recording identical 12.812 on that previous lap, equal right down to the thousandth! 1408 – Clarke made a huge move under brakes into the final turn to hold off Olson and also nearly slid it sideways under Curtain, major aggression and major impressive from an out of practice and self confessed as completely unfit rider, although a Clarke unfit is still less than 55kg wringing wet… Clarke to the lead! 1401 – Olson back up to second and crosses the line almost alongside Curtain. He makes his move under brakes into turn three. Someone down at turn three… Who is it? Carr? yes I think it is Mitch Carr signalling an end to a disastrous round for the Triumph man that has sent him from the series lead to well down in the field. 1356 – Clarke on a charge now and challenging Gobert. Brodie has already got past Gobert to take fifth place. 1340 – Well the lunch break was a little longer than I expected but the track being readied now and Supersport men heading out of pit-lane. 1250 – Reekie takes the win by 10.7 seconds from Nicolson. 1219 – The gap now 0.439. Maxwell, Allerton and Bugden all nose-to-tail, Herfoss in sixth place running quicker than all of them but a couple of seconds behind them, ruing that early mistake at turn three no doubt..
1218 – Maxwell into the 9s now. He is 4 seconds behind race leader Jamie, and Jamie has 0.458 advantage over Josh, that gap narrowing slightly again now… Bugden challenging Allerton, the BMW man responding and quickening his pace to close on Maxwell again..
1216 – Gap back down to 0.674 now, the pace slowing a little now, only that top pair in the 9s and drifting back to the high 9s. 1212 – Glen wags the tail of that BMW out of that tricky and bumpy turn two for that all important slingshot down the back chute. 1206 – Jamie by far the first to roll into position, that position pole. Front row is Jamie, Glen, Ben and Josh…. They are away! 1200 – The Racesafe crew out of the cars and lined up along the straight standing to attention for the anthem, a smart look. 1148 – Thackeray and Falzon providing the on track action here with massive moves under brakes at nearly every turn. 1139 – They’re away! Falzon got out of the hole well and again Jones not the best off the line, no doubt he will be in the lead before long though! 1124 – Geronomi has really broken away from Gurd now. Following this race we have Superstock Race Two followed by the big boys of Superbike shaping up for their first race pace crack at Qld Raceway for the weekend. 1108 – Moller now with the bit between his teeth and goes past a swag of them to promote himself through to second place… Who will win that battle for second on the run to the line…. Hook the winner by a country mile…. But….. It’s Moller that has his nose in front at the line to take second place from Diles, Hill and Venter. Phillis went down on the exit of the double-left on the final lap. 1057 – They’re away! Hook already pulling a significant lead on the rest of the field. 1042 – Olson pulls alongside through to turn five, but Clarke manages to hold him out. All that experience Clarke gained those years ago certainly hasn’t left him. 1040 – Curtain has the win that’s for sure, but second place far from settled. 1034 – Curtain puts in a 12.7 to pull a couple of lengths on Olson that time around. He might have broke him! But there is still eight laps to run so it’s far from over. 1032 – The two Yamaha men still at it up front, nine laps to run. 1028 – Aaron Gobert has worked his way through the mid-pack and is now up to fourth, five seconds behind the leading trio though. 1026 – Olson having a crack here, letting it all hang out and showing the elder statesman of the team some serious aggression. 1024 – Olson to the lead now, Curtain second, Clarke third and showing he hasn’t forgotten how to ride. 1023 – Curtain leads them across the stripe for the first time from Olson, Clarke, Carr and Waters. 1017 – Tyre warmers coming off now. 1016 – Superport grid forming up with teams still on the grid, riders being interviewed for the TV coverage. 1001 – Last lap now, the top three remains the same and will do all the way to the flag as long as they stay upright. Ross will claim fourth. 1000 – Magee has settled the pace a little now to maintain his advantage, still 2.1 seconds clear of Medcalf with two laps to run. Halliday third and I believe that order is where they will finish. 0955 – Six laps to run and the order is Magee with a clear buffer over Medcalf, Halliday, Ross then some distance back to Nicolson, Yates, Snowsill, Houterman, Yanko and Anthony Quinn rounds out the top ten. Magee has woke up with a cracker up his clacker this morning and is one fire! 0952 – As they commence lap three Magee has 1.6 seconds on Medcalf, Walters, Halliday and Ross. Great racing from this category this weekend. Magee is on a mission and running in the mid 11s!